Welcome to The King’s Academy Online High School and Middle School Program! 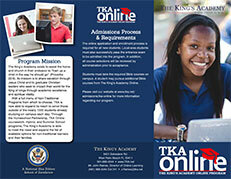 The King’s Academy Online prepares middle and high school students for college success. Enroll full-time and earn an accredited high school diploma from The King’s Academy, or part-time to supplement a traditional school or homeschool curriculum. An accredited high school diploma (ACSI, SACS, and FACCS) from a nationally-recognized Christian school founded in 1970. King’s curriculum, available entirely over the internet, allows students to take courses anywhere in the world, any time of day. King’s enrollment policy allows new students to apply at any time, with new courses beginning every week. Parents can access and review their student’s academic progress through the online grade book, discussion boards, and student responses. Students work from their own ideal, safe environment—at home, your local library, or a community technology center. Textbooks online are provided by nationally renowned curriculum developers.